As I’m in the process of uploading this duo of early Bluebirds to my YouTube channel (which you should most definitely take a look at if you like this kind of music), it seems like a fine time to do another Bluebird Dance Band Double Feature. Last time, I featured some of the sweet style of music that dominated pop music in the early 1930s, but this time I’ve got a couple of hotter bands for you, led by Paul Tremaine and Gene Kardos. Bluebird B-5049 was recorded April 14, 1933 in New York City by Paul Tremaine and his Orchestra. On the first side, they play sweeter on Harold Arlen and Ted Koehler’s “Stormy Weather”, which had recently been debuted in the Cotton Club Parade of 1933. 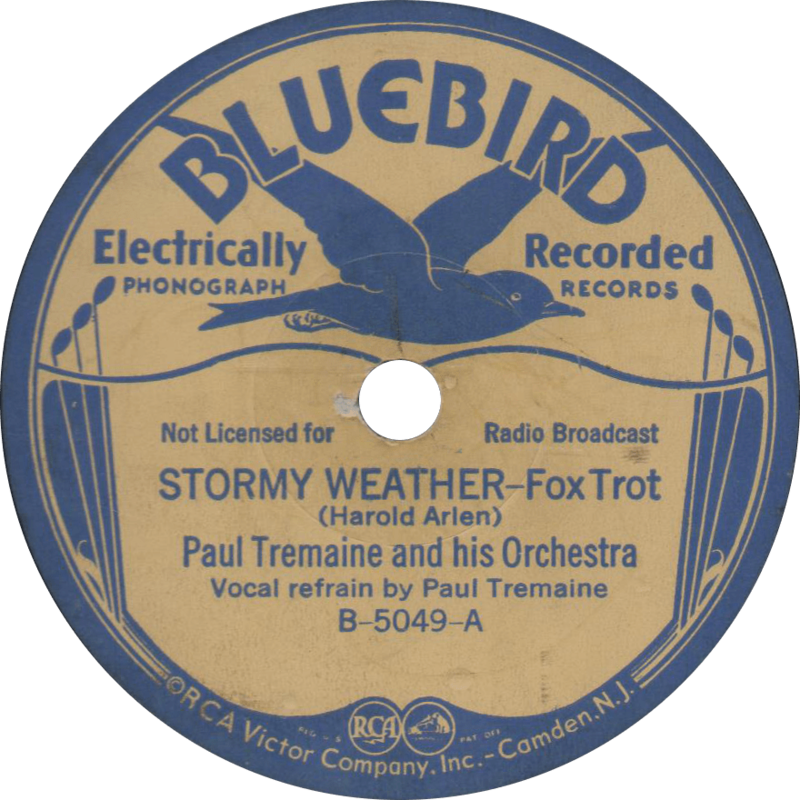 Stormy Weather, recorded April 14, 1933 by Paul Tremaine and his Orchestra. On the reverse, they play “Hand Me Down My Walkin’ Cane”, a remake of the rendition they had recorded for Columbia in February of 1930 (I’ll post the original sometime, too). 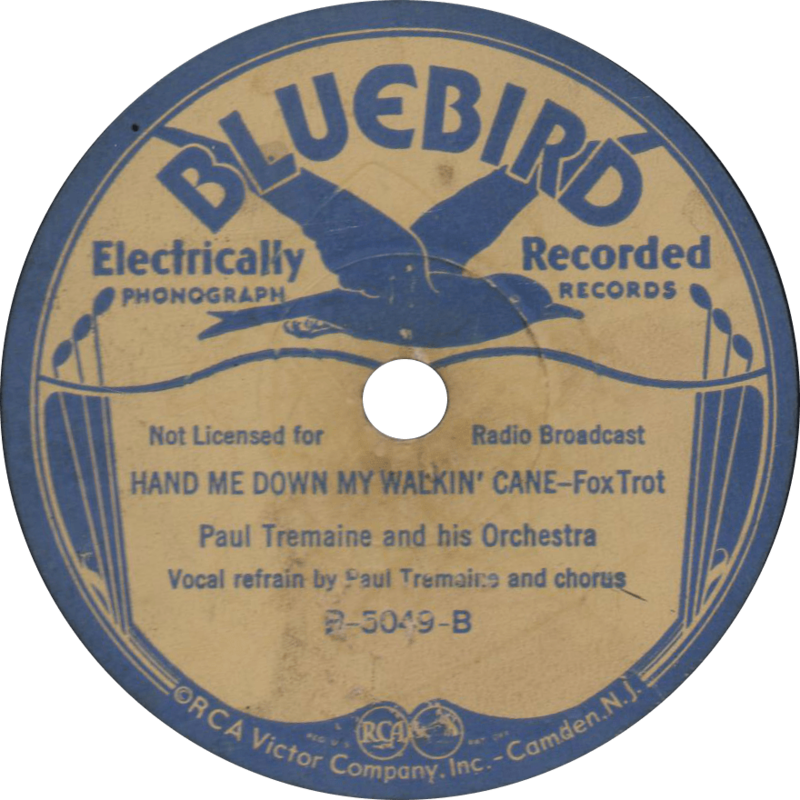 Hand Me Down My Walkin’ Cane, recorded April 14, 1933 by Paul Tremaine and his Orchestra. The two sides of Bluebird B-5053 were recorded on two different occasions. The first side is another by Paul Tremaine, a wild “She’ll Be Comin’ Around the Mountain”, recorded at the same April 14, 1933 session. That one is also a (considerably more frenetic) redo of one of their 1930 Columbia recordings. Be sure to listen for the little bit of “hinkle dinkle rooty too” between two of the choruses. She’ll Be Comin’ Around the Mountain, recorded April 14, 1933 by Paul Tremaine and his Orchestra. 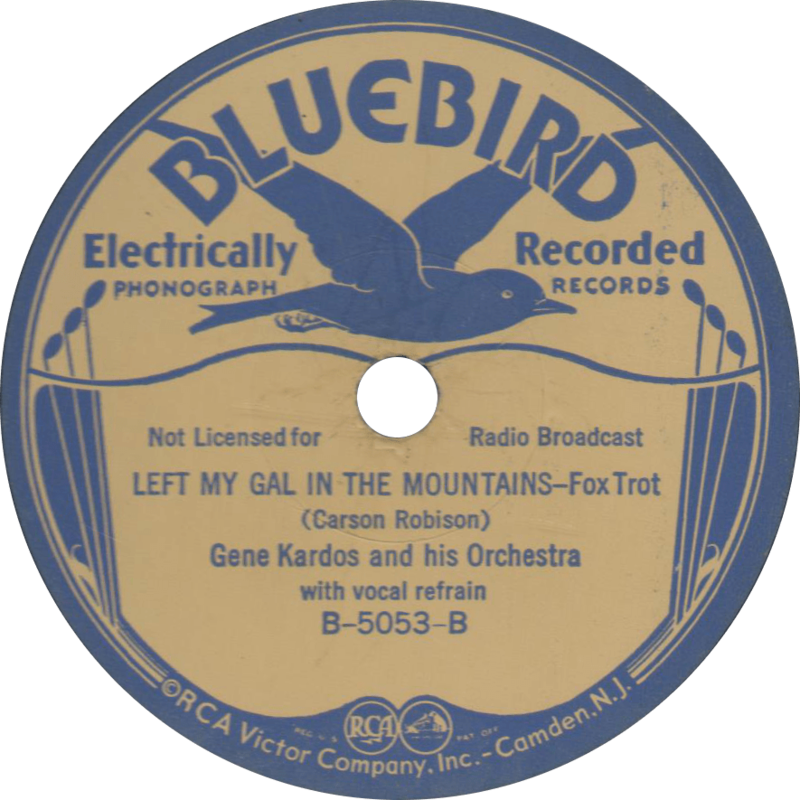 On the flip-side, Gene Kardos and his Orchestra play a hot rendition of Carson Robison’s “Left My Gal in the Mountains”, recorded June 10, 1931 and originally issued on Victor’s short-lived Timely Tunes budget label. This was Kardos’ first session. The band consists of Sammy Castin and Willie Mayer on trumpets, Milt Shaw on trombone, Gene Kardos on alto sax, Joe Sagora on clarinet and alto sax, Morris Cohen or Nat Brown on clarinet, alto sax, and tenor sax, Joel Shaw on piano, Albert Julian on guitar, Danny Bono or Ben Goldberg on tuba, and Saul Howard on drums. The vocalist is Albert Julian. Left My Gal In The Mountains, recorded June 10, 1931 by Gene Kardos and his Orchestra. Updated on June 24, 2016 and April 29, 2018. This entry was posted in Records and tagged 1930s, 1931, 1933, Albert Julian, Ben Goldberg, Bluebird, Carson Robison, Dance Band, Danny Bono, Double Feature, Gene Kardos, Harold Arlen, Jazz, Joe Sagora, Joel Shaw, Milt Shaw, Minstrel, Moe Cohen, Nat Brown, New York, Paul Tremaine, Popular, Sammy Castin, Saul Howard, Sweet Music, Ted Koehler, Timely Tunes, Victor, Willie Mayer by R. Connor Montgomery. Bookmark the permalink. The Timely Tunes date of June 10, 1931, was indeed Gene Kardos’ first session.